Despite a weak box office total, I found 2017 to be an excellent year for film overall. The summer movies didn’t deliver as expected, Star Wars wasn’t as well received as we’d all hoped, and there may not have been a singular all-time great movie to hang our collective hats on. But, in terms of the number of high quality films that were (mostly) available to wide audiences throughout the year, I’m not sure we could’ve asked for me. I’ve been writing about film and tracking my grades/reviews since 2004. In that time, I don’t think I’ve ever given out more than four “A+” grades in a single year. I gave out seven in 2017. In addition, there were any number of “A’s” and “A-‘s” this year, unmatched by any year in recent memory. As such, when I sat down to write my Top 10 list, I realized there were far more than 10 films that I really wanted to highlight and talk about (as if I don’t get enough time to do just that on the stupid podcast). So, I put together a Top 25, which is both a nice, solid number and the clear line of demarcation between the films I absolutely had to talk about and the rest of the pack. Today I present to you, dear readers, numbers 11 through 25, withholding my top 10 for the podcast (recording this weekend). I’ll publish the remainder of this list next week once the podcast episode has had some time to breath. Here we go. I made a point of holding off on the writing and formation of this list until I had seen Molly’s Game and I’m glad I did. Much like Wind River (see below), this movie is the directorial debut of a noted screenwriter (Aaron Sorkin) and at times, you can see the filmmaker’s novice on display. Chastain, however, is a force to be reckoned with, right at home with Sorkin’s famously fast paced, quip-y dialogue. The sheer magnetism of her persona covers up a multitude of sins and Sorkin’s script does an excellent job of highlighting the right parts of the source material without letting it get bogged down in the more detail than absolutely necessary. Taylor Sheridan (Hell or High Water, Sicario) has made a name for himself in recent years as one of the best screenwriters in the business. Wind River is his directorial debut and while it doesn’t quite live up to the standard he’s set for his writing, I think it’s quite clear that his future behind the camera is bright. It’s dark and deathly serious but Sheridan adds just enough tension breaks to keep the movie from becoming an unbearable slog. Renner and Olsen are both excellent and the movie sheds light on shadowy subject. The best parts of Darkest Hour (Gary Oldman, fantastic subject matter, Gary Oldman, a strong supporting cast, Gary Oldman, etc.) are top-five-movie-of-the-year good. Watching Oldman manifest himself in the form of Winston Churchill is a sight to behold. This is perhaps THE highlight of a career made up of highlights. I just wish this movie had been directed by almost anyone else. Joe Wright is, frankly, incredibly boring and his sensibilities in shot composition, musical cues, and special effects “splashes” are just as boring. The result is a good movie featuring great performances instead of being great all around. It’s amazing to me that WB can get animated Batman so incredibly right while also getting live-action Batman so incredibly wrong. The opening sequence in LEGO Batman is a better plot device than anything conceived in Justice League, Suicide Squad, or Batman V Superman. How is that possible?! Arnett is a stellar Batman and re-teaming him with Cera is a stroke of genius. Most of all, though, this version of Batman has a sense of humor about himself, a welcome respite from the current live-action Batman who enjoys branding his victims. You likely know this by now but I ride for Cruise all day, every day. No one cares as much as Cruise and in the history of film, I’m not sure you can find an actor who has consistently delivered on the promise of entertainment for as long as Cruise has. American Made is a highly enjoyable flick infused with life by Doug Liman’s little touches of flash throughout. It doesn’t hurt that the subject matter is very interesting and, of course, Cruise is out there doing classic Cruise things. What a fun ride. In a year that didn’t feature a whole lot of surprises for me, this was the outlier. I didn’t think a Jumanji sequel/reboot was necessary and the trailers didn’t do much to assuage my feelings of disinterest. So, suffice it to say, I was shocked by how smart, entertaining, and overall fun this movie turned out to be. This cast is FULLY invested in what should be a complete throw-away action comedy and the setup is far more impressive than I ever would’ve thought imaginable. Jumanji has more life to it than most of its contemporary blockbusters and I must say, I now welcome any and all sequels that are to come in this series. This is by far the weirdest movie on this list. I don’t even know what to compare it to. Napoleon Dynamite with a kidnapping subplot? Brigsby is unique and strange and funny and surprisingly heartfelt. It’s not going to be everyone’s cup of tea but it worked beautifully for me and ultimately became one of the more fun film experiences of the year. On first viewing, Wonder Woman was one of my five favorite films of the year. On second, third, and fourth viewing, my appreciation waned a bit. Even still, this movie is a massive accomplishment in the post-Nolan DC Cinematic Universe because, after all, I was very willing to rewatch it a second, third, and fourth times instead of swearing upon the life of my dog to never see it again like I did with Batman V Superman, Justice League, and Suicide Squad. To be sure, this is an awesome comic book movie in a year stuffed with great comic book movies. Gadot is magnificent, Pine is an awesome counterpart, and Patty Jenkins proved what a great director can do when Warner Brothers leaves her alone. And it had one of the great action scenes of the year which never hurts. It is difficult to write about Three Billboards without getting bogged down in the backlash against it. For the record, I understand the argument against it but feel those advocating for it are missing the point. I’ll consider it here as a film and nothing more and as a film, it’s quite excellent. Martin McDonagh is a master when it comes to creating dark and grimy characters in dark and grimy settings and in this arena, Three Billboards might be his masterpiece. The cast is utterly brilliant, not just the three mentioned above, all of whom are very likely to receive Oscar nominations (if not wins), but all the way down to the police officer with one line in the film. It’s difficult to watch and downright unpleasant at times (many times?) but McDonagh handles it with as little gratuitousness as possible and for that I am thankful. The concluding chapter of the Apes trilogy, War is the best of the bunch (so, obviously, it made less money than either of its predecessors). 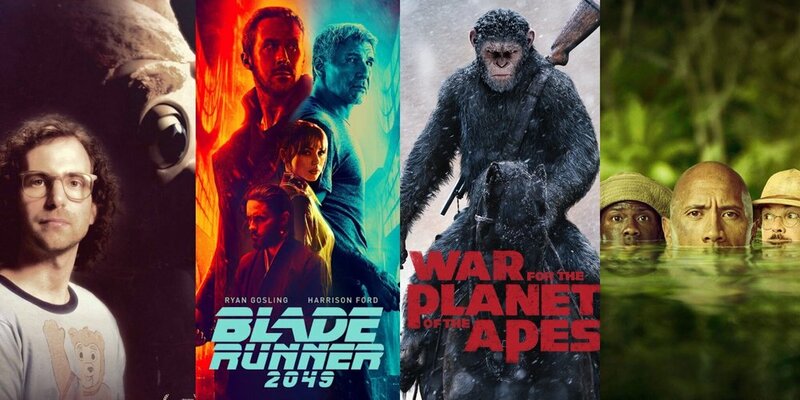 Movies about talking monkeys really have no business being this good but Andy Serkis is a genius and his commitment to his character (we’re talking about a CGI ape here) is uncanny. Add in Woody Harrelson and Steve Zahn with a fantastic scene-stealing performance with a plot that actually feels relevant to the current climate, and you’ve got an unbelievably good movie…about a bunch of talking monkeys. I did not have Star Wars as the most divisive film of the year coming in. Totally caught me by surprise. I went up and down, back and forth with The Last Jedi and eventually just accepted the very good segments of the movie (about 80-85 percent of the movie by my very scientific calculations) and chose to overlook the rougher segments. At the end of the day, I really, truly love what Rian Johnson was trying to do (and I think succeeded in doing) in the macro sense and wish the micro elements had been tightened up. I think he’s put not only this trilogy but also the next set of films (which he will helm) on the right track and in five years, Last Jedi will be far more fondly remembered by fans than it was initially received. I ran the gamut of emotions on this one in the months leading up to its release. On the one hand, I love the property, I love the cast, and I love the director (Denis Villeneuve). On the other, a Blade Runner sequel featuring Harrison Ford risks answering the famous question posed ambiguously by the original and thereby diluting that film. Villeneuve handled this issue beautifully just like the rest of the movie. Gosling is terrific, the movie looks AMAZING, and while the story drifts a bit here and there, overall, it’s a breathtaking film that, I think, will age extremely well (just like the original). I had this in my top 10 for most of the winter and it pained me to drop it out. Ultimately, it lost a place or two because I don’t know that I’ll ever watch it again and it’s a hard one to recommend to a broad audience. For a one-time viewing, however, A Ghost Story is a triumph of filmmaking and a movie that stuck with me for weeks after I saw it. David Lowery is a name you may not recognize now but you will soon, following the critical success of this movie and his previous film, Pete’s Dragon (also fantastic). He’s the type of guy a studio should hand all of the money to and allow him to do whatever he wants. Affleck and Mara are both excellent, expressing more with head nods and mannerisms than most actors can convey with actual dialogue. Touching, beautiful, and, if you’ll forgive the wording, haunting. As with Three Billboards, for the purpose of this list, I’ll only look at this as a movie and set aside the cultural conversation regarding its star. I honestly didn’t expect to enjoy this movie nearly as much as I did. I expected it to be overly dark and uncomfortable given what I know about The Room and its bizarre leading man, Tommy Wiseau. At almost every opportunity, however, Franco (as writer and director) displayed a shocking lack of cynicism in regard to Tommy. In doing so, The Disaster Artist essentially mocked the product without mocking the man and ultimately made the movie something enjoyable instead of something to get through. I’ve seen Homecoming more times than any other film on this list. My kid LOVES this movie. I love that he loves this movie. I also love that his love for this movie means Spider-Man 3 (which was his favorite Spider-Man movie before Homecoming) has gone unwatched for months, praise the Lord. Marvel truly nailed it with this one, finally giving us a Spider-Man worth investing in long-term. Holland embodies both Peter Parker AND his superhero alter ego (something neither of the previous iterations could do) and has an awful lot of fun in the process. The John Hughes-ian screenplay and direction doesn’t hurt in this regard, either. It is Keaton, however, who gives Homecoming its gravitas and provides the perfect antagonist for Parker/Spidey. I loved this movie, I think it’ll hold up incredibly well moving forward, and I truly can’t wait to return to its universe.